Cheers! Happy New Year! If you are a football fan, the new year brings bowl games, playoff games, and, of course, the big game! Bring these apple cider mimosas to your next game day party. They will be a huge hit! 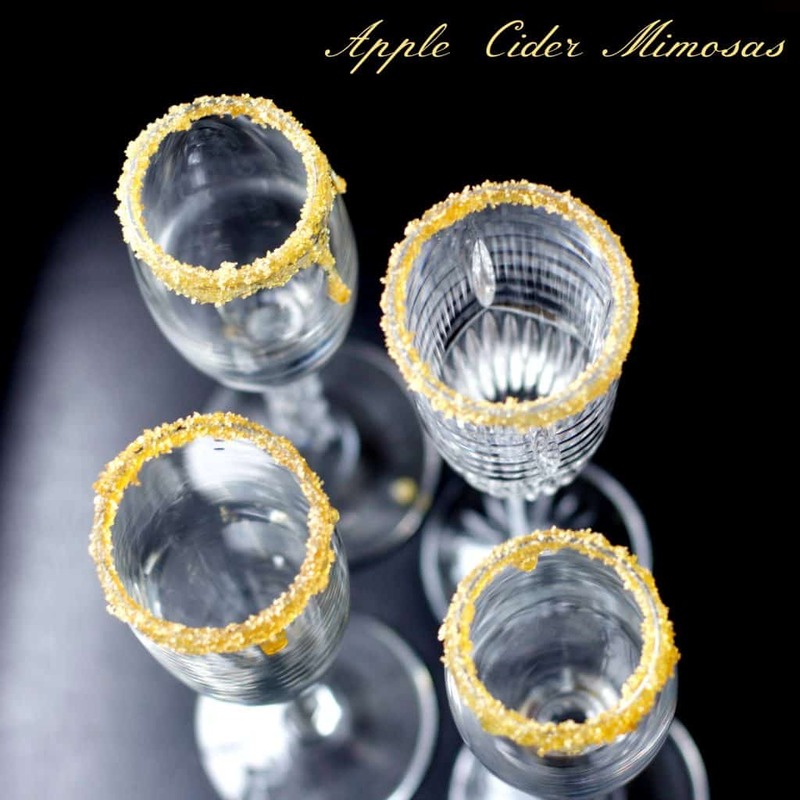 Apple Cider Mimosas – Game Day Treat! This winter, I was looking for a cocktail that was fun and refreshing but also used seasonal ingredients. Seasonal ingredients might not be too prolific in these cold, winter months, but I bet you have seen apple cider at your farm stand or grocery store! We are lucky to have a lot of local cider options here in North Carolina. The perfect cocktail mixer! Apple cider mimosas just need apple cider and a drink that sparkles like a champagne or prosecco. That’s it! Two ingredients! This cocktail is as much fun to make as it is to drink. 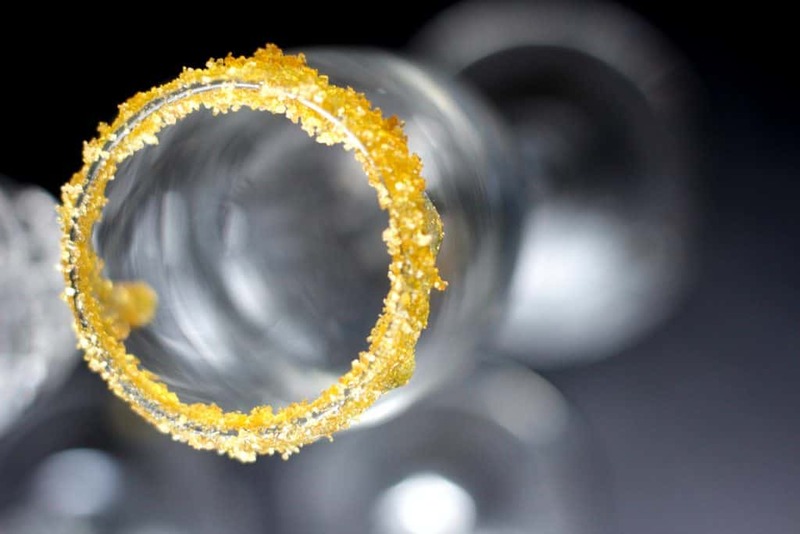 The sugar rim could be optional – but your guests will love the extra sparkle – I promise! I found gold and silver decorator sugar at my favorite place – Home Goods – and I found red sparkle sugar on sale at my local grocery store. You can mix any fun, sparkly color with brown sugar for this cocktail project. 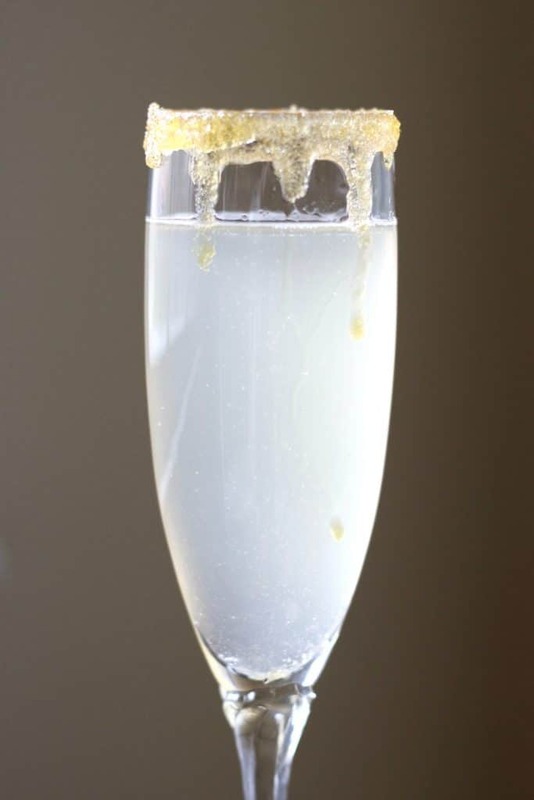 To get the sugar to stick to the rim of your apple cider mimosas, use honey. What goes better with apples than honey? This rim is amazing! Dip your glass evenly in the honey and then do the same thing with your fancy sugar. For some parties, my kids have made the rims ahead of time but, for our last get together, I brought the sugars and honey and set out two plates so guests could rim their own glasses. Hands-on cocktail making! Apple Cider Mimosas – Spoil your favorite football friends! Make these apple cider mimosas for your next game day party! Don’t forget the sparkly sugar rim! 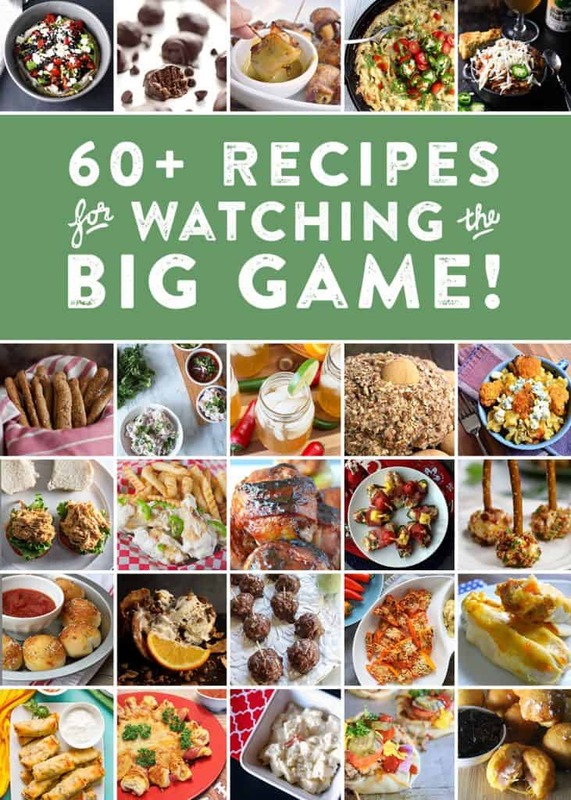 For more great ideas to help you celebrate all the fun football games coming up, be sure to check out the 64 Football Foodie recipes below! Enjoy! With just a few ingredients, this drink will be the star of your next party! Combine brown sugar with decorator sugar. Put in a small teacup saucer. Add 2 to 3 tablespoons of honey to a 2nd saucer. 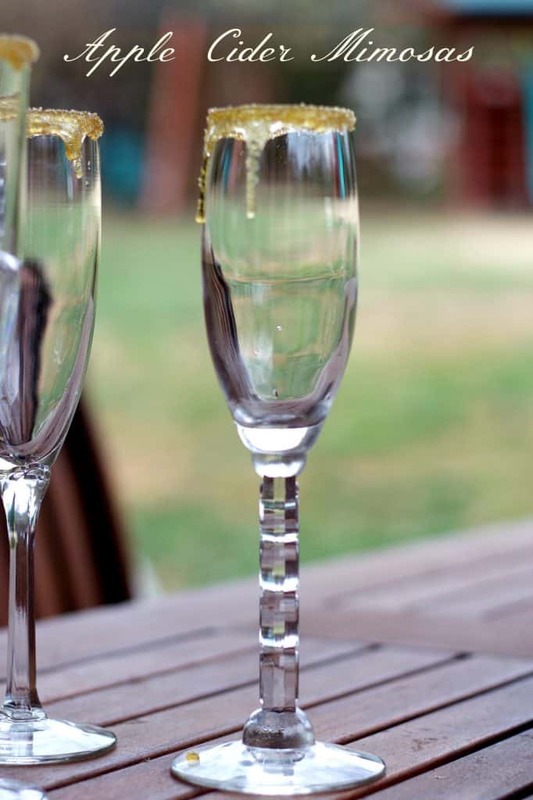 Dip the champagne glasses in the honey so that the rim is evenly coated with honey. Dip the champagne glasses in sparkly sugar. Fill champagne glass halfway with cider. Top with champagne or prosecco. ENJOY!! For other Game Day Recipes … check out the links below! I’m such a big fan of anything with champagne in it! Looks so good! nice looking drink! love the different ingredients here and the prosecco suggestion is much preferred, thank you for this! Thanks, Sabrina!! I am a huge prosecco fan!